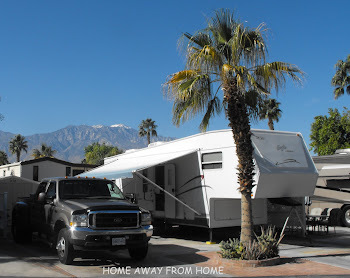 We’d been on the greatest RV Adventure we could ever have imagined but it was time to leave the Coachella Valley and Palm Springs for the last leg of our great adventure and start making our way home to Kamloops B.C. We had not made any RV park reservations but would follow the sun to the Pacific Ocean of Southern California and find a good place to put our feet in that ocean. We were sure we would have no problem finding that perfect RV park. The freeways through the Los Angeles area are busy no matter when you travel but we found late morning was the best and we were passing thru Ventura within a few hours and seeing the water. We pulled over at the Ventura State Beach to enjoy the waves and take some pictures, but this wasn’t where we’d walk in the water. We had planned to work our way up to Pismo Beach. We left there and followed Hwy 101 and passed some very pretty green valleys. Early March was a great time of year to see the colors of the area, with wildflowers scattered over the hills and the grass still green before the hot summer sun changes that. The Ventura area is also great wine growing country. We are too early to see any bloom on the vines but we pass miles of them as we travel past Santa Maria, CA. We checked our list of RV parks and made one successful call and were booked into what turned out to be “that perfect RV park”. We couldn’t have chosen a better one had we known what we were doing or where we were going ! Sheer luck, with all the choices that we had and we were happy when we drove in to Pismo Coast Village RV Resort. It wasn’t long and we were walking in the Pacific Ocean on a beautiful Pismo Beach. We had put our feet in the Atlantic Ocean while visiting the Maritimes and also walked in the waters in the Gulf of Mexico while in Corpus Christi so this was a must to add to our RV Adventure. The gulls were searching for dinner at the mouth of Pismo Creek, which run alongside the RV park. There were several people walking along the beach and enjoying the late afternoon sun, and their dogs are loving their walk, too. The town’s first pier, seen in the distance, was built in 1881 at the end of Main street and was used to save freight fees for South County products. That pier collapsed in a storm in the 1890’s and the new pier was built in 1924 and was much longer than it is now, which is almost 366 M (1200 ft.). Their beach is considered the finest sand beach in California. These wildflowers grow along the sand dunes in front of the RV park. There are pink and yellow ones, which color the path leading to the beach from one entrance. These may have a long season but in the springtime it’s a guarantee. They have to be strong plants to withstand the amazing conditions they live in and we saw these as well as others all along the coastal shores. Mr. and Mrs Duck enjoy a stroll along the sandy path meandering past the RV park. 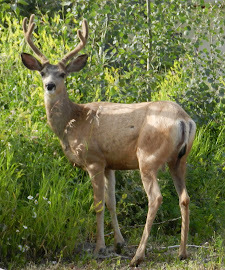 There were several of them seen coming into the RV park at times to check things out. They seem quite conditioned to human visitors and don't seem to mind the intrusion in their neighborhood. Pismo Creek’s headwaters begin in the Coast Range of the Los Padres National Forest and flow approximately 20 km (11 mi) to the ocean at Pismo Beach. It bypasses the rv park and then creates a waterway between the mainland and a berm before flowing into the ocean. It makes for a bird paradise with food arriving daily and great nesting places in the sand and foliage. What could be a nicer way to end the day than a sunset at the beach. We sat on the rocks at the “perfect” RV park, savoring the moment and enjoyed the setting sun. There are more colorful sunsets happening many evenings but we will have to wait until our next visit for that, in the meantime, this one was perfect. Pismo Beach, with a population of 8600, is the Clam Capital and hosts a Clam Festival in October, including a parade and lots of family fun. They have a Classic Car Show following Father’s Day every year, a Jazz Festival and their annual July 4 Fireworks show. Check their webpage for events happening during your visit. In Ventura and Pismo Beach, there are many activities for all to enjoy including wineries, golfing, horseback riding and surfing as well as riding the dunes. There are miles of beautiful beaches. ATV’s as well as street vehicles can drive on designated Pismo beaches. I will be sharing more of the beautiful California coast with you. There is so much more to enjoy. Great pics! Pismo Beach - Just love the sound of it!